It seems like it's going to require a high-profile disaster before anyone gets serious about unmanned death from above. It's not only targeted assassinations that we have to worry about -- intelligence officials are becoming increasingly worried about terrorists and drug cartels mastering such cheap and effective homicide tech. And if that's too far from your own backyard, what about the fact that random nobodies can shut down a major airport for two days at the cost of millions of dollars and over a thousand delayed flights? According to DHS official David Glawe, "This threat is upon us today. I wake up in the morning and night just hoping we don't have an attack." 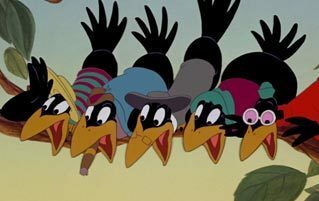 But with the current laws on the books, federal agents are only allowed to track and try to catch drones when they land. That's it. They can't legally be shot down. All the authorities can do is shake their fists at the sky like a bunch of angry old men, yelling at clouds. 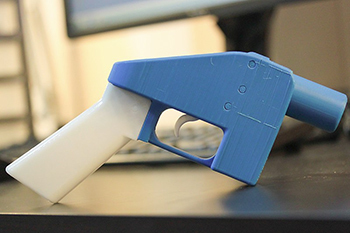 Hey, did you know you can straight up print a gun? The blueprints are online and free to read, and there are step by step guides on how to use them, in case you're new to 3D printing or overcome with confusion by the current and temporary lack of a firearm in your hand. And while the end result, somewhat ominously dubbed the Liberator, looks like something a child of the '80s would have found at the bottom of a cereal box, it's capable of firing a single deadly bullet at close-to-moderate range. Vvzvlad/Wikimedia CommonsJust send in three proofs of purchase and a manifesto, and you too can blow your hand off. That may not mean much in America, where you can pick up a six-pack of shotguns at Safeway. Plus, the guns are prone to shattering uselessly in the user's hands. But their lack of serial numbers makes them impossible to trace, and their plastic body makes them invisible to metal detectors. That means they're quite attractive to people who can't legally own a gun, yet still really, really want to shoot someone. The Obama administration ordered the creators of the Liberator to take their blueprints down, but the company sued and reached a settlement with the Trump State Department which allows them to continue posting the blueprints online. Democrats are now pushing legislation that would make it illegal to publish gun blueprints and/or legally require part of the gun to be metal, but the legal battle will no doubt rage on for quite some time. You don't have to worry about a 3D-printed firefight breaking out in your front yard just yet; the bigger concern is hobbyists blowing their own hands off. But 3D-printed firearms are only going to get better and cheaper as the years go by, so the sooner the legalities are figured out, the better. 3D printers can also make copies of keys. You don't even need the physical original, just a clear photo. 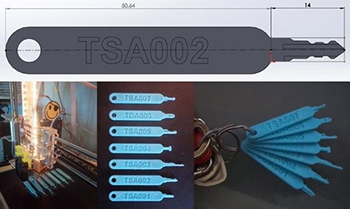 When The Washington Post published an article that featured a high-resolution photo of the TSA's master keys (used to open luggage locks during screening), they were immediately replicated by 3D printers. So don't take any selfies prominently featuring your car keys, folks. XylitolAlso, maybe don't buy a luggage lock, since at this point they're about as effective as a sticker that says "Please don't steal my things." Criminals have also used 3D printers to make ATM skimmers, and in Portugal, three men were arrested for 3D-printing counterfeit Euro bills and coins. That's all hugely illegal, of course, but the easier it gets, the more complicated it will be stop criminals from literally printing money. 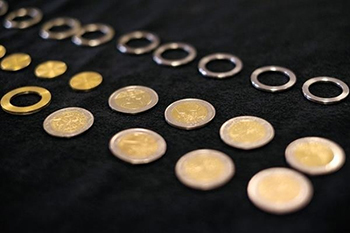 Portuguese PoliceTwo-Euro coins? Way to swing for the fences, guys. Once upon a time, Family Guy stole a clip of an old video game glitch from a small YouTube channel, because -- and you may need to sit down for this -- Family Guy is not a bastion of morality. A 90-second joke about a minor programming mistake from 1987. Way to keep it tight, MacFarlane. It doesn't only happen to the little guy, as Microsoft's own very smart AI ended up censoring its biggest competitor: Microsoft. 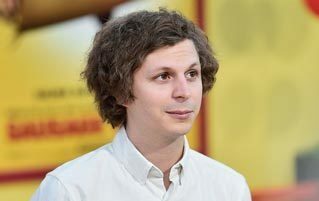 While trying to stop pirates who were profiting from Microsoft's copyrighted material, their software targeted itself and automatically filled DMCA takedowns on its own URLs. And lest you think that was merely an act of rebellion against the evil that made it, the bot also tried to censor the BBC, Google, the American government, and even the nefarious Wikipedia. But at least Microsoft had the resources to undo its own destruction. What happens when some random creator gets hit? Google found themselves deluged with 4.5 million weekly notices, so they said, "To hell with reviewing the validity of every request! Our robots will figure it out ... probably." One of them was a bad review of a business, which was automatically taken down after the review was pasted onto an obscure website and backdated, making the original look like the thieving copy. Google can't be expected to handle millions upon millions of copyright claims manually, but with no punishment in place for false claims, there's little stopping a company from destroying a video or website -- not because it violates copyright laws, but because they're inept. Or maybe because they flat-out don't like it. For every legitimate service dog, there are half a dozen fake emotional support alpacas shitting on the floor of a mall food court. These animals have zero therapeutic credibility, but a cottage industry of fake registries and service vests has given a veneer of authenticity to people who want to cheat the system and bring their dog into a Hardee's. 21 states have mounted a "major crackdown," trying to combat the human weasels who put orange vests on anything, up to and including actual weasels. In Minnesota, for example, it's now a misdemeanor and a whopping $100 fine for fraudulent misrepresentation. In Arizona, where it's a whole $250, the senator who sponsored the bill explained, "I couldn't go into a store or an airport or even an office without seeing some disorderly four-legged creature dragging its owner around, wearing a vest that said 'service animal.'" While federal guidelines at least define a service animal as a dog (or miniature horse), they also make it illegal to ask for any proof whatsoever. Privacy concerns need to be respected, and we know such conversation makes for a potentially mortifying situation. But so does having to mop up a gallon of horse urine from the Sizzler salad bar. At least the government admits that it's inappropriate to bring a horse along when getting surgery. The world is simultaneously a better and worse place now that we know we will never be randomly seated next to a turkey on a plane. FlexiSPYBoasting a feature list that feels like it should require about 15 warrants. eBay or Amazon alongside a new video game and some laundry detergent. GCOM TechnologiesIt's the perfect gift for the undercover FBI agent and/or dangerously possessive spouse in your life. Many of these activities break various state wiretapping laws, but a complete lack of federal regulations has created a series of loopholes wherein companies can market their product for its explicit legal uses. The developers know exactly what they're doing -- the innocuous-sounding KidGuard bought ads connected to Google searches for "catch cheating spouse app." And then YouTube tutorials that explain how to take advantage of these tools get a cut of the profits, thanks to their affiliate marketing deals. So that's another fun way that big tech companies are screwing everyone. As if we needed one. E. Reid Ross has a couple books, Nature is the Worst: 500 reasons you'll never want to go outside again and Canadabis: The Canadian Weed Reader, both available at Amazon and Barnes and Noble. You can find Tiagosvn on his Twitter if the machines haven't already.